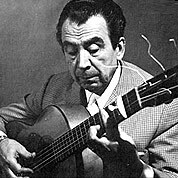 Niño Ricardo was a Flamenco composer, considered by some as the most accomplished flamenco player of his day. He played a significant part in the evolution of the flamenco guitar. A child guitar prodigy, his early audiences referred to him as the son of Ricardo, leading to his stage-name Niño de Ricardo. His fingernails grew in a peculiar upward curve, a fact that influenced his playing style and tone.